As NASA planned the logistics for a proposed space station, called Space Station Freedom, in the early 1990s, one of the agency’s concerns was ensuring that the modules— individual station compartments to be constructed on Earth and flown piecemeal by space shuttles into low-Earth orbit—would be properly attached to each another. A critical part of the assembly process involved crewmembers leveraging the shuttle’s Canadian-made robotic arm, Canadarm, for the heavy moving, and engineers wanted astronauts to receive positioning cues sufficient for setting objects within an inch and a degree of one another. On December 4, 1998, Space Shuttle Endeavor launched Unity, the first US-built module of the International Space Station, into low-Earth orbit. 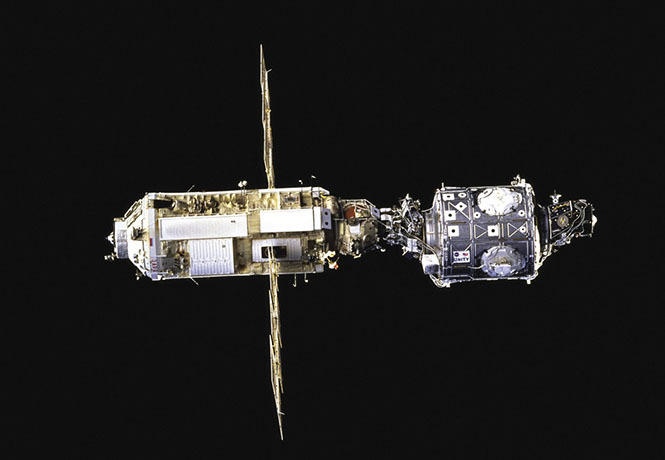 Once in space, the shuttle performed rendezvous and docking maneuvers to attach Unity to Russia’s Zarya module. Neptec Design Group’s Space Vision System was used to provide the necessary visual cues. A solution was found in a technology called the Space Vision System (SVS), developed by Ottawa, Canada-based Neptec Design Group, a contractor for the Canadian Space Agency. Using standard cameras to track black and white dots placed on the space station modules, the SVS processing system would display their location and orientation at 15 frames per second, giving astronauts the necessary realtime visual cues for successfully connecting these large and costly research and habitation components. Although the Space Station Freedom project was eventually discontinued, the SVS went on to be used in the construction of the International Space Station (ISS). For Neptec it was also the start of a long engagement in the US aerospace industry, serving as a Houston-based NASA prime contractor tasked with developing 3D sensor applications to help spacecraft safely navigate the dark, formidable backdrop of the cosmos. Neptec Technologies’ Obscurant Penetrating Auto-Synchronous Lidar, or OPAL, family of 3D laser sensors, unlike conventional lidar technology, is able to penetrate dust, operate in total darkness, and withstand considerable vibration and shock. One of Neptec’s important succeeding contributions came as a result of the Columbia Space Shuttle disaster in 2003. The tragic accident was the result of foam insulation breaking off the external tank during launch and striking the left wing, causing damage that ultimately led to the spacecraft breaking apart upon reentry. Aside from assisting in analyzing video imagery of the accident— expertise they gleaned from working with the SVS—the company also helped fulfill one of the agency’s mandates that resulted from the investigation: more detailed safety inspections of the space shuttle before reentry through Earth’s atmosphere. Neptec helped accomplish this by installing its Laser Camera System, or LCS, onto a 50-foot boom, which was grappled by the shuttle’s Canadarm to capture images of the spacecraft’s thermal protection system. What made the LCS particularly effective was that it was able, using triangulation, to render a three-dimensional map of the shuttle’s hull. That data was relayed back to Johnson Space Center, where engineers could use a 3D printer to produce a physical model. “We didn’t have to do this every flight,” says NASA’s David Moyer, who helped ensure shuttle safety, “but it was nice to have those models because when we did have those cases where there was some damage, we were able to give those high-definition maps to the project’s damage assessment team.” Fortunately, shuttle repairs were never needed. Neptec has gone on to further develop its 3D sensor capabilities. Funded by NASA and the Canadian Space Agency, the company’s TriDAR 3D sensor combines the company’s LCS technology with a long-range Lidar system in allowing spacecraft to rendezvous and dock with each other. The technology automatically acquires and tracks the target spacecraft without the use of any markers and can operate in total darkness. Originally developed in part to prepare for an unmanned mission to repair the Hubble Space Telescope, TriDAR was successfully tested on three space shuttle missions, including the program’s final flight in July 2011. The space shuttle program’s closure heralded the end of an era for Neptec, but it also signaled new beginnings for the company, which in the same year founded a separate firm, Neptec Technologies Corporation, to commercialize its made-for-space products for the terrestrial market. For example, not only is TriDAR being used by Orbital Sciences Corporation to dock its Cygnus cargo transport spacecraft to the ISS; a slightly modified version of the technology has found its way onto helicopters to help pilots see through dust during landings. But Neptec’s main commercial entrée is the Obscurant Penetrating Auto-Synchronous Lidar, or OPAL, family of 3D laser scanners, which is derived from, among various other projects, its TriDAR and LCS contracts. Working in unison with its corresponding 3DRi software development toolkit, OPAL is designed to help machines operate in challenging environments where safety and efficiency is key. Much like how Neptec’s contributions have allowed NASA spacecraft to navigate their missions in the dark expanse of space, OPAL, which uses a Risley prism pair for laser beam deflection, is designed to help businesses, such as mining and offshore gas and oil companies, more efficiently operate machinery in similarly dark and dangerous surroundings. Neptec Technologies CEO Mike Sekerka says there are other 3D laser scanners on the market, but they lack several of OPAL’s capabilities, the first being its real-time video feed. “Most laser scanners that are out there are used for survey-type applications,” he says, “so they’re usually too slow for navigation.” It’s also the only device that, because of its lineage to space-approved technologies, can penetrate dust, operate in total darkness and withstand a high degree of vibration and shock. “We really designed this for environments that no other laser scanner has been able to operate in,” he says. The company has already started collaborating with two global mining companies by installing OPAL scanners on their excavators and haul trucks. The size of these machines, combined with the often limited light and space in which they operate, makes it difficult for operators to maneuver to desired locations on the first attempt. OPAL will help by allowing operators clear visual access to their targets, saving precious time as a result. Because equipment and other industry costs are high, increasing efficiency pays dividends. “If this technology shaves one or two seconds off the average spot time, that translates to millions of dollars a year in increased revenues,” Sekerka says. With recent investments being made by industry in driverless haul trucks operated by remote control, Sekerka notes that 3D intelligence technologies such as OPAL are generating even greater interest. The scanner’s ability to operate in murky water also makes it an appealing tool for companies extracting oil from deep underwater fields. “There are lots of opportunities to take this technology to a number of applications and markets,” he says.